The 26° ETC Source Four Junior Zoom 575W Black Ellipsoidal Spotlight with 3-prong Edison plug combines the energy-saving power of the patented HPL lamp, with a dichroic reflector and optical-quality lenses. Source Four technology provides a clean white beam for unequaled imaging, crisp pattern projection, and a bright, even field. When fitted with a 575W HPL bulb (available separately), this fixture will provide a beam of 88 footcandles 13.2 ft (4.2 m) in diameter, from a distance of 30 ft (9 m) @ 25° zoom. It will throw 63 footcandles 17.8 ft (5.4 m) in diameter, from a distance of 20 ft (6 m) @ 50 ° zoom. This model includes a 3 prong Edison Power Plug. Other models are available, with Pigtail, Stage Pin, and Twist-Lock connectors. Box Dimensions (LxWxH) 23.543 x 10.472 x 10.394"
Source Four Jr Zoom Ellipsoidal, Black, 25-50 Degree (115-240V) is rated 5.0 out of 5 by 5. Rated 5 out of 5 by Dj Ace from Awesome projector for wedding gobo! This light fixture is perfect for professional DJs...its small enough (not tiny tho) for a pro light and the output is strong enough even for a well lit room. I added the m pattern gobo holder, and light bulb. Also love BH's photo product specialist they no there stuff. I highly recommend this light to DJs looking to add something new to there arsenal and want pro results! Rated 5 out of 5 by Anonymous from Quality fixture I use this fixture for adding patterns to backgrounds for interviews, etc. It's a workhorse and gets the job done every time. The fixture itself is a little bulky, (far less bulky than the full size) so you are not going to shove this thing in your light kit with LED panels, but it's rugged enough to carry around on its own without worrying about it getting banged up. It couldn't be easier to use, the entire fixture can be loaded with a lamp and adjusted, quickly and without the use of any tools. Set it to 50 and you can fill a large wall from a short distance. I like to tweak the zoom adjustment to soften the projection a bit. The beam is cooler than most other tungsten fixtures at this wattage because of the dichroic reflector, so it doesn't kill your patterns/gels as quickly as other/older fixtures. Grab one of these, a pattern holder (does not come with fixture) and some M-size gobos and you can make a white wall far less boring. Rated 5 out of 5 by MM from Truly a workhorse! These lights are truly a workhorse of a Chief Lighting Technician's tool kit... especially if you have overhead grids. Great for mood lighting, dimmable, and they cool off around 15 minutes after being shut off. Rated 5 out of 5 by Chuckesgal from Great Product! Fast Shipping. Love this light. Came quick. Works great. Be sure to order a light bulb when you order this though, it does not come with one. What's the Kelvin for this light? 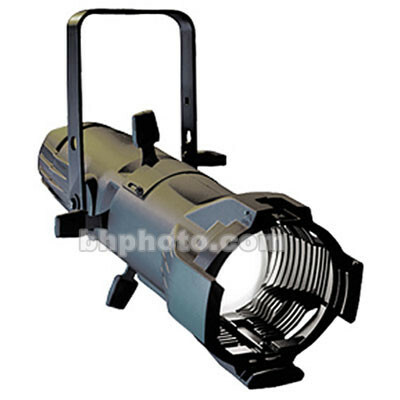 This ellipsoidal uses tungsten halogen lamps which give a color temperature of 3250 Kelvin. One of those lamps would be the Ushio HPL Lamp (575W/120V) B&amp;H # USHPL575. Please see the image below. what is the maximum throw distance? There is no maximum throw. It relates to how bright you want the light to be in relation to the throw and how wide you need the light to cover.The light can use different wattage bulbs and in combination of the zoom will give you brighter and dimmer light.The photometric on the light can be down loaded at this link http://bit.ly/1Seqefo.